Kerrywalks-The Kerry Way-County Kerry hotels and B&B`s. The Kerry Way And The Dingle Peninsula. 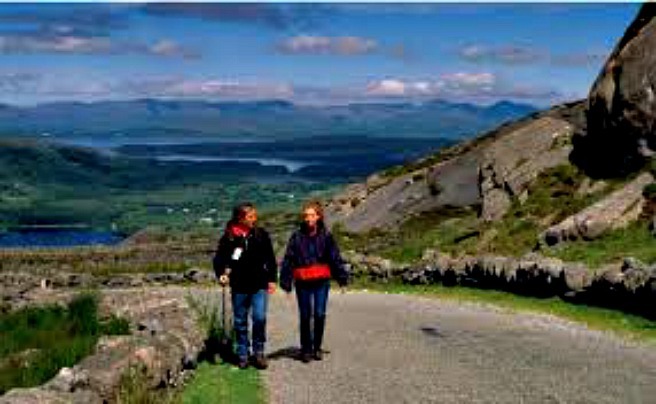 Kerry Walks is the saying the Kerry people call Walking in County Kerry, is an exhilarating and highly enjoyable experience, a way of seeing the real County Kerry, without noise or petrol fumes. Just get up and go on one of our famous Kerry Walks. Driving is an ok kind of thing, but you just drive by and don’t see anything till your destination. The destination especially in County Kerry is always great, but what about the places in the middle. The Towns and villages are fabulous, but the places in between are the real gems of County Kerry. The only way you will find these gems is to take a walk, take a walk around County Kerry. Feel the wind in your face, the rain on your head, and the pint of Guinness at the end of your day. The two of us will take this challenge on, lets go for a walk, and I don’t mean any old walk, let’s go for a walk around County Kerry. If you are a seasoned walker then you know that you have to have the proper footwear. A good pair of stout walking shoes will take you all day on County Kerry lanes. Up Kerry hills and mountains, down valleys, negotiating bogs and rough stony ground. To take on all this type of terrain and more you need to protect your feet in leather walking boots. Leather allows your feet to breathe because it is porous. Ventilation is the key to comfortable feet because even if boots are sodden, which is very possible around County Kerry, drying out can begin with your feet inside them. Only the stout construction of a walking boot can give the ankles the support they need to minimize the risk of sprains. Only leather can mould itself to the feet providing the fit that allows you to walk the Kerry Hills all day comfortably. When choosing walking clothes, remember that wind is potentially a serious problem. It reduces the body temperature dramatically because of the heat loss in evaporation. A walk that starts in a light breeze as you leave Killarney Town can be a battle with a gale as you traverse MacGillicuddy`s Reeks. Plan accordingly; have layers of clothing that can be shed or added to. Remember, too, that significant body heat is lost from the head: So wear a hat. Waterproofs need choosing carefully, and there is a good chance you will need waterproofs in Kerry. The waterproof that opens up the front allows air to get to your body.